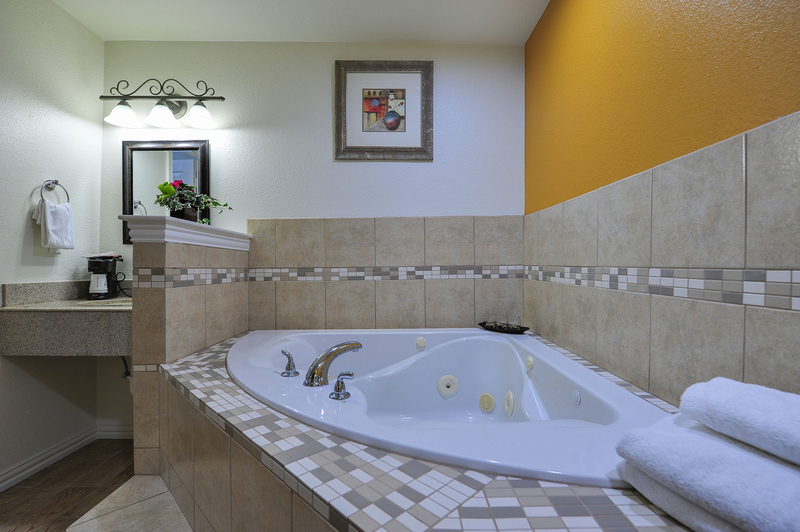 A hot tub for two awaits you in our Honeymoon Suite! Step straight from a bubbling whirlpool bath into our custom-made king beds with soft lighting and a mirrored ceiling panel. Relax on a leather loveseat with a flat-screen TV and a variety of specialty channels. Chocolates, mints, and water bottles are available to all guests when you check in. 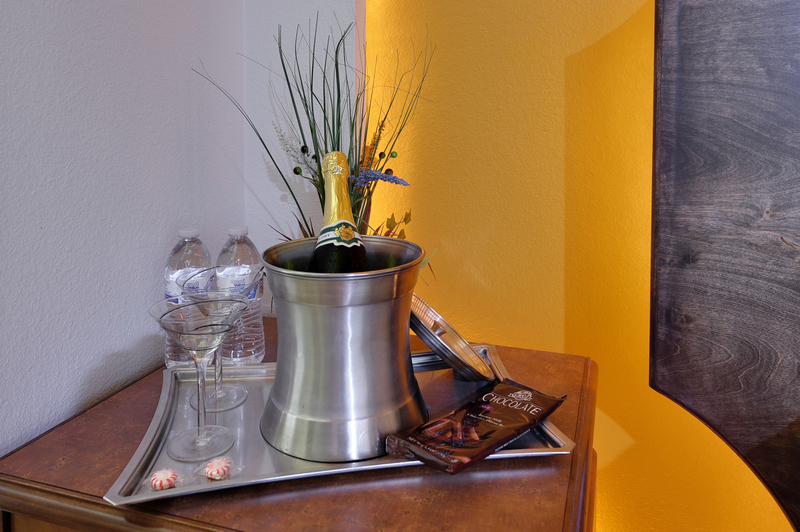 When you book the Honeymoon Suite, a chilled bottle of champagne is free with your stay, to elevate your romantic Dallas getaway to the next level. Add a banner, silk petals or candles to your room to start celebrating right away! Our adult-only suites are minutes away from downtown Dallas. After a night out, come back to a Honeymoon Suite to celebrate, relax, and unwind. 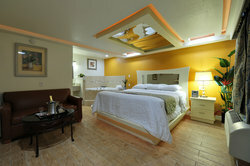 Our Honeymoon suites come with special, luxurious amenities that will make your evening a night to remember. Relax in an in-room spa, enjoy a glass of champagne, and so much more. 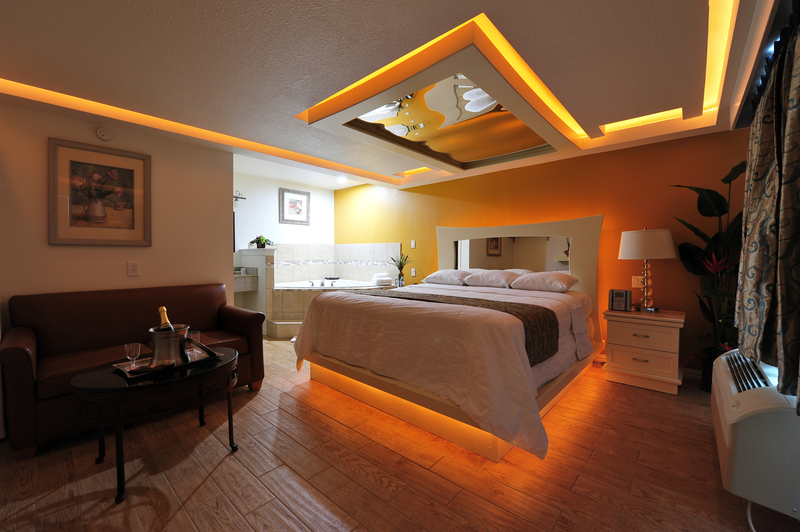 King size custom made beds that lights up from every corner including the bottom. 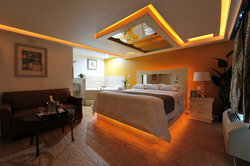 Contemporary designed mirror ceiling with a touch of soft lighting. 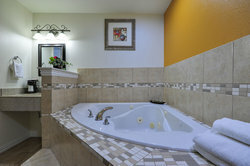 Leather love seat and Jacuzzi / hot tub for two and all other amenities including complimentary mints, ice, water bottles, chocolates and a chilled champagne on your arrival. 32" Flat screen TV with 4 HBOs, 2 Cinemax's, 2 ESPNs, 2 Spanish, plus 40 local channels and Free Adult Movies. Alarm clock with MP3 so you can listen to your own music from your own CD or from your I phone. All suites have mini fridge microwave and coffee makers. iron, ironing board and hair dryers are available only upon request. With an additional $15 charge, On your arrival any other specials items such as silk petal design on your bed, Happy Birthday or Anniversary balloons or stickers are available with very nominal charges. *Our above mentioned rates are our now second anniversary 60% off from rack rates excluding tax and add $3 hotel service charges.Anticipated rooms only and subject to availability. Can not be conjugated with any other offer. Above rates are not available in prime periods or special events. This offer may still available please click on BOOK NOW button. 32" Flat screen TV with 4 HBOs, 2 Cinemax's, 2 ESPNs, 2 Spanish, plus 40 local channels and Free Adult Movies. Alarm clock with MP3 so you can listen to your own music from your own CD or from your I phone. All suites with spa have mini fridge, microwave and coffee makers. Iron, ironing board and hair dryers are available only upon request. * Above mentioned rates are our second anniversary 60% off from rack rates excluding tax and add $3 hotel service charges.Anticipated rooms only and subject to availability. Can not be conjugated with any other offer. Above rates are not available in prime periods or special events. This offer may still available please click on BOOK NOW button. 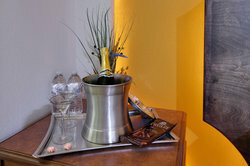 * Honeynmoon Suite rates are our now second anniversary 60% off from rack rates excluding tax and add $3 hotel service charges.Anticipated rooms only and subject to availability. Can not be conjugated with any other offer. Above rates are not available in prime periods or special events. This offer may still available please click on BOOK NOW button. 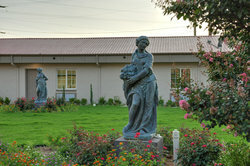 Featuring a Roman garden theme, this love hotel provides romantic accommodations for adult Couples Only. Free Wi-Fi access is also available. 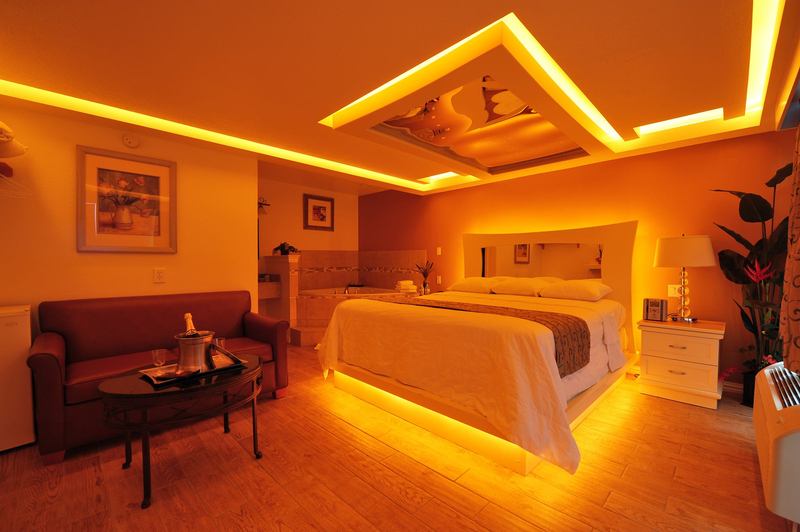 Soft lighting and romantic decor set the mood in each room at Romantic Inn & Suites. Cable TV with access to pay-per-view channels is also included. Some of the themed suites include a pole and stage, a large mirror or a spa tub. The private bathrooms are stocked with free toiletries. 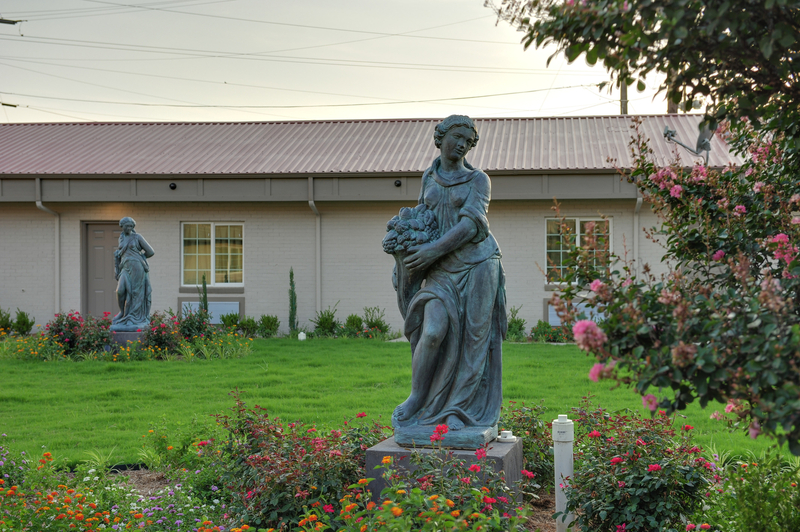 A 24-hour front desk and free parking are among the conveniences provided at Romantic Inn & Suites. With an additional $20 charge, we will provide you a chilled Champagne, Chocolates, Ice, Water Bottles, Mints and Chips on your arrival.